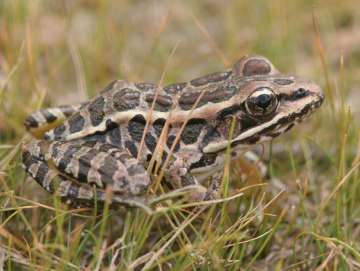 Northern leopard frogs are champion jumpers. They can leap 20 times their body length. Their dark spots are rounded and appear in a random pattern on a brown or green background. Notice the light outline around the spots. In Westborough with its many ponds, vernal pools, streams, and swamps, we often find frogs at our feet during a summer walk along a trail. They include two spotted frogs that look nearly alike. But first, if something jumps away from your feet as you walk a path near water, is it a toad or a frog? If takes little hops, it’s probably a toad, but if it makes long leaps, you’re probably looking at a frog. Early in the summer, say, in the first weeks of July, many of the frogs or toads under foot are tiny, maybe barely an inch long. They’ve just come out of the water – sometimes in droves, it seems –after changing from tadpoles into frogs or toads. By now, in early August, they’ve grown a bit and are larger. Looking down at a frog, even a small one, you might notice two narrow, light stripes running down its back. In this case, you’re probably looking at a northern leopard frog (Rana pipiens, Lithobates pipiens) or a pickerel frog (Rana palustris, Lithobates palustris). These two near look-alikes both have dark spots on a green or brown background, but the spots are easier to see when the frogs are adults. The adults are medium sized as frogs go. That’s 2-4 inches for a northern leopard frog and 2-3 inches for a pickerel frog. Take a good look at those spots if you want to figure out which of these two frogs is at your feet. You can see how leopard frogs got their name. They have irregular, rounded spots in a fairly random pattern, like leopard spots. You may be able to see a light border around these dark spots. Pickerel frogs, on the other hand, have rectangular spots. These box-like spots are often lined up in two parallel rows on a pickerel frog’s back. You’ll see another difference only if you catch the frog and pick it up. Leopard frogs have pale inner thighs, but pickerel frogs have bright yellow or orange inner thighs. Catching the frog can be quite a challenge, especially if it’s a leopard frog. It often gets away by making two or three long leaps in different directions, zigzagging away from you. Next thing you know, it has vanished into the trailside vegetation, or jumped into water. These leaps make it hard for us to follow the frog’s escape route. They also make the frog hard to track if you’re a snake following the frog by its scent. Pickerel frogs have toxic skin secretions that help to ward off many predators. Their dark spots are rectangular on a brown or green background. The box-like spots are often in two parallel rows along the frog’s back. Leopard frogs can jump up to 20 times their body length. That’s 3-6 feet for an adult frog. They leap not only to escape predators, but also to catch some of their own meals. For example, they’ll grab an insect with their tongue at the highest point of a leap. When they leap, they pull their bulging eyes inward to protect them. They also have a “third eyelid” – a thin milky membrane – that comes up to cover their eyes. The leopard frog’s back legs power these impressive leaps. Their well-developed legs also make a tasty morsel for some people, so these legs can end up in a dish that features frog’s legs. Pickerel frogs also escape by leaping away, but in addition, they have a more unusual defense against predators. Like some toads, they have glands in their skin that produce toxic or distasteful juices. Many predators learn to avoid them. 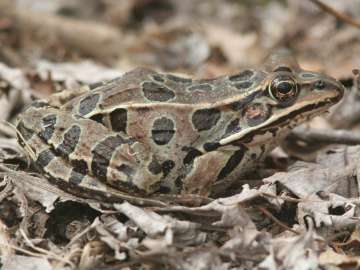 For example, snakes that eat leopard frogs, such as garter snakes, ribbon snakes, and water snakes, typically pass up a meal of pickerel frog. If a pickerel frog gets swallowed, it quickly pumps out so much toxic juice that the predator may actually spit up the frog. These skin toxins may also cut down on the bacteria and fungi that might otherwise grow on the frog’s moist skin. The yellow or orange color of the pickerel frog’s inner thighs may serve as a warning color that tells predators to leave it alone. We’re generally too tall to glimpse this color flashing from the pickerel frog’s legs as it leaps away, but a ground-level predator is likely to spot it. In spite of the toxic skin secretions, certain fish do eat pickerel frogs (and their tadpoles, which are also toxic). Pickerel frogs got their name because they’ve been popular as fish bait with people who fish for pickerel. These frogs won’t poison a human – they’re not the poison dart frogs of South America that we see on TV! The skin secretions might irritate your skin or eyes, so it’s a good idea to wash your hands if you manage to catch one. Both leopard frogs and pickerel frogs breed in ponds with vegetation (which they use for attaching their eggs) in the spring, typically March to May. Males are somewhat smaller than females. Their mating calls sound somewhat like snores, and these frogs sometimes even call underwater. For the summer, these frogs leave the ponds and spend much of their time on land, in moist environments. Leopard frogs often like open areas, such as damp meadows. For this reason, they’re also called meadow frogs or grass frogs. They absorb water from dew through their skin. Pickerel frogs often spend the summer by the sides of streams. Both of these frogs pass the winter in a dormant state in the mud and debris at the bottom of ponds or streams. Sometime in October, they become hard to find! What other frogs might you spot at your feet? Wood frogs (Rana sylvatica), which breed in vernal pools in early spring, usually spend their lives in the surrounding woods. They have a dark, bandit-like mask across the eyes. American toads (Bufo americanus) are also common along woodland trails. Bullfrogs (Rana catesbeiana, Lithobates catesbeianus) and green frogs (Rana clamitans) typically live in or very near water year-round. Outside of the breeding season, tiny spring peepers (Hyla crucifer, Pseudacris crucifer) and gray tree frogs (Hyla versicolor) spend a lot of time in trees and bushes. In any case, enjoy our local frogs, whether you actually see them or just notice a leap or a plop into water. They are sensitive to pollutants and can serve as indicators of water quality and environmental health. We’re lucky to have them.